In a decision from the New Jersey Appellate Division, the court has ruled that an alimony-paying husband could not obtain a modification of his duty to pay alimony based on changed circumstances, where the husband was not sufficiently proactive in attempting to improve those changed circumstances. The case was titled Beden v. Beden. The couple at the center of the case were married in 1980 and had three children together before their 2010 divorce. The couple agreed on a property settlement agreement which provided that the husband would pay the wife $800 per week in permanent alimony, terminating only upon the death of either spouse or remarriage by the wife. By October of 2014, the wife had returned to the family court to seek to have the husband’s alimony obligation enforced. The judge ordered that the husband make a lump payment to cover his alimony arrearage, and that he sell the home that the couple had shared. The husband did not appeal the order, but he also did not comply with it. The wife returned to court in April of 2015, again requesting that the court force her former husband to comply with the alimony requirement imposed through the couple’s property settlement agreement. This time, the husband requested that his alimony obligation be recalculated retroactively to March of 2014, when he claimed to have been laid off. The judge rejected the husband’s request in June of 2015, ruling that the husband had not made a case of changed circumstances warranting a modification of the alimony agreement. 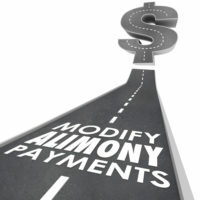 When a spouse or parent seeks a modification of alimony or child support owed before a court in New Jersey, the judge will require the alimony-paying spouse to prove that their circumstances have changed in a substantial and long-term manner. When a spouse loses their job, this is not an immediate cause for recalculation of support payments. The spouse or parent must prove that they are making a good-faith effort to find a job but have been unable to do so and don’t believe that they will find one in the near future. Alternately, they can try to show that a replacement job is unlikely to pay what they made previously. In this case, the husband testified that he had been searching for a job, but that “there [were] no jobs” for someone in his position. Upon further exploration, the court found that his job search between March of 2014 and April of 2015 had consisted of posting his resume online, attending one job fair, and applying for seven jobs. The court found that this half-hearted attempt to find employment did not constitute a good-faith effort and refused to recalculate his alimony obligation. If you’re facing a family law issue in New Jersey such as a divorce or custody dispute, or if you need help enforcing a support obligation, contact the dedicated, seasoned, and knowledgeable Union family law attorney John B. D’Alessandro for a consultation at 908-964-0102.